Podcast Episode 71 — Have Courage To Be The Leader! Hello, and welcome to the Leadership Done Right Podcast, Episode 71: Have Courage To Be The Leader. Hi Friends! Leadership is not easy and there is a lot you can be afraid of! In this episode, I am going to talk about some of the fears we can have in leadership and how we can have courage to overcome them. It seems like most, if not all, people have something they really fear. Fears can be very real at times. They can cause people to freeze up and even tremble. Other times, fear keeps people from moving forward towards their goals. It is much easier said than done, but when you are the leader, you cannot let fear take control of you. If you let fear have a hold on you, you will become an ineffective leader. When you let fear take a hold of you, you are giving it control over you. Fear can be debilitating if you let it be. [Read more…] about Podcast Episode 71 — Have Courage To Be The Leader! Podcast Episode #70 — Prioritize Effectively Using This Proven Strategy! Hello, and welcome to the Leadership Done Right Podcast, Episode 70: Prioritize Effectively Using This Proven Strategy! In this episode, I am going to talk about why it is important to prioritize effectively. But first, I want to share a little story with you. I have noticed that through my life there’s been times where it was really easy to be intentional and focused. During those times, I got a lot done in both my professional and personal life. There’s other times when life gets so busy with other people planning or heavily influencing my life that it feels like you are swimming an uphill current. During those times, I feel like I’m doing everything I can to stay afloat with a heavy current of events and activities pushing and pulling me in several different directions. Oner the last few months, I’ve been doing a little bit of both. I traveled a little over three weeks on business, went on two family road trips, did a complete overhaul on my house and was involved in several other high profile activities for my employer. I have felt like I was making slow progress while fighting a strong current. I must say though, through it all I feel I have been making progress. The reason? I have prioritized my activities into three buckets. Now let me explain the three buckets to effectively prioritize. [Read more…] about Podcast Episode #70 — Prioritize Effectively Using This Proven Strategy! Hello, and welcome to the Leadership Done Right Podcast, Episode 69: 5 Reasons Why You Should Keep a Leadership Journal. Hi friends! Several years ago I started writing in a journal. I wrote about what happened each day and what my thoughts were on that event. I tried to keep each day to about one page, but if something exciting happened sometimes it went longer. Also, if I was really busy, sometimes it was less. Since that time I have continued keeping a journal through the years. In the leadership realm, there’s a lot of great people that talk about the importance of writing in a journal. From my experience, I agree wholeheartedly that there are benefits to writing in a journal! What is a Leadership Journal? I am going to share five reasons why you should keep a leadership journal. But before I get to that, it is important to understand what a leadership journal is and how it differs from other journals. Hello, and welcome to the Leadership Done Right Podcast, Episode 68: Change Through Transformation and a Complete Makeover. Hi friends! For you that are regular listeners of this podcast, you probably noticed that I didn’t have an episode last week. That was because I spent the last week and a half repairing, reflooring, and repainting my house. I want to share a story about that and how it relates to change through transformation. My wife and I bought that house as newly weds and we really loved it! We lived in the house for four years until I was promoted and moved to a different state. At that time, the housing market was near the bottom so renting it out was the only option. Hello, and welcome to the Leadership Done Right Podcast, Episode 67: 5 Stories of Resilience. Hi friends! Last week I shared the story of Abraham Lincoln and how he was resilient to overcome the challenges that he faced in life. Each challenge helped him on his journey to becoming the President of the United States and one of the most influential people in history. This week I would like to continue that theme. In this episode, I am going to share five stories of resilience. Each of these stories give me hope and help me have the courage to get back up when the going gets tough. As you listen to these stories, some of these stories are shared in the own words of those who experienced the challenges and got back up. I used clips from those people and will include links to their stories in the show notes. Be sure to check them out! Back in 1992 at the summer Olympics, the USA gymnastics team was fighting for the gold medal. On that team was a young woman named Kerri Strug. Well, that summer, USA only took home the bronze. In fact, the USA never had yet received the gold medal for the Team-All-Around event. They were determined to beat Russia and Romania in the next Olympic games. Hello, and welcome to the Leadership Done Right Podcast, Episode 66: How to be Resilient When the Going Gets Tough! Hi friends! To all you that are listening in the United States, I hope you had a great Labor Day Holiday! This week we are going to talk about how to be resilient when the going gets tough. We’ll discuss five points to consider when you are in the middle of challenges and struggling. One of my favorite people in history is Abraham Lincoln. He was an American statesman and lawyer who served as the 16th President of the United States from March 1861 until his assassination in April 1865. Lincoln led the United States through the American Civil War—its bloodiest war and perhaps its greatest moral, constitutional, and political crisis. In doing so, he preserved the Union, abolished slavery, strengthened the federal government, and modernized the economy. Podcast Episode #65 — How to Become a Top Negotiator! Hello, and welcome to the Leadership Done Right Podcast, Episode 65: How to Become a Top Negotiator! Hi friends! One of the most important leadership and life skills I use on a daily basis is negotiation. Although, I am not an expert negotiator, I have gotten a lot better through the years. I regularly practice negotiation and read good negotiation books. My goal is to get just a little better with each negotiation. In this week’s episode, I am going to share negotiation insight I learned from Stuart Diamond’s negotiation book, Getting More. We’ll discuss times when we negotiate, the overall getting more approach, three key negotiation principles, and the 12 Getting More negotiation strategies. Stuart has an extensive background in negotiation and has helped very influential people negotiate through challenging situations. His techniques are so powerful that he used them to help end the 2008 Hollywood writer’s strike. Before we get into the meat of his techniques, I want to share a story with you from Rayenne Chen. She’s a graduate from Stuart Diamond’s negotiation class at Wharton Business School. “My run slowed to a jog as we approached the gate for our flight to Paris. The plane was still there, but the door to the Jetway was shut. The gate agents were quietly sorting tickets. They had already retracted the hood connecting the Jetway to the airplane door. “Hi, we’re on this flight!” I panted. “Sorry, we can’t board anyone after they’ve closed the door.” [Read more…] about Podcast Episode #65 — How to Become a Top Negotiator! Hello, and welcome to the Leadership Done Right Podcast, Episode 64: 5 Pieces of Advice for New Leaders. Hi friends! In this week’s episode, I am going to share five tips for new leaders. These tips will help you start off on the right foot so you can gain the respect of those you lead. Before we get to that, I want to share some quick tips for the week. Every year around this time, I start thinking about education. My kids are going back to school and I can feel fall coming on. I love the feeling and I love thinking about education. I also love thinking about and setting new goals. With those two thoughts in mind, I set goals for education for the upcoming school year. If you have not completed all of your educational goals, now is the best time ever to start those goals back up. Look into opportunities to progress your education. There’s many ways you can do that. I have other posts and podcast episodes that focus more specifically on education, so I won’t go into much more detail now. Here’s just a few ways you can advance your educational goals. Go to school, get into a certification program, take an online course, or look into other programs to advance your education. 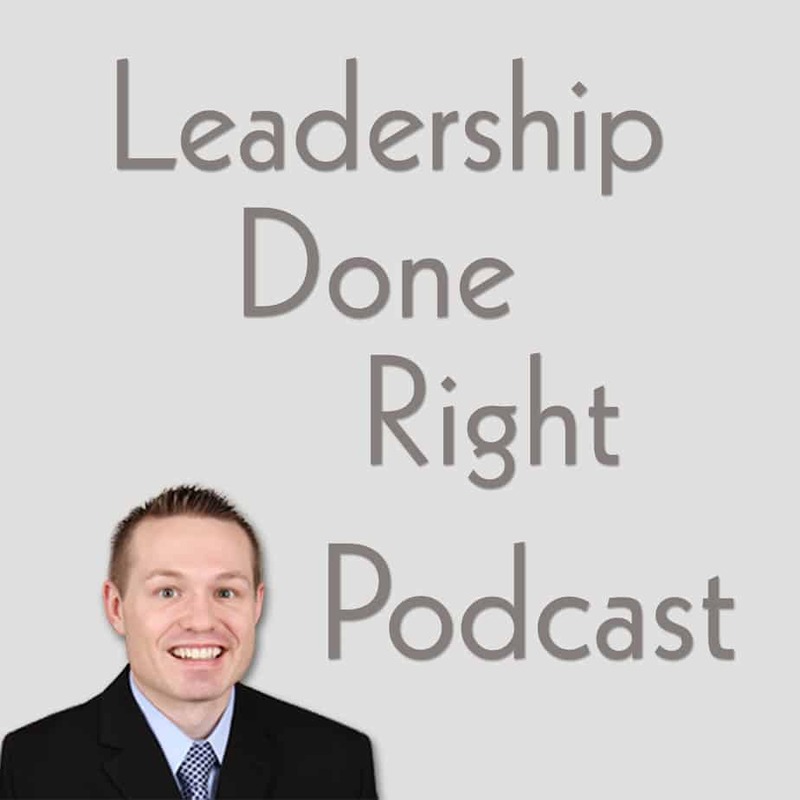 Hello, and welcome to the Leadership Done Right Podcast, Episode 63: 5 Tips For Leadership and Personal Progress. Hello, hello! This week I was out with some friends and we were doing some off-roading in my truck. I stopped for a moment so we could look at some wildlife in the area. When we decided to go again, I shifted the car and hit the gas. By accident, I shifted to neutral so I wasn’t going anywhere. I casually said to my friends, “Well, I can’t go anywhere without the car in gear. I can’t go back or forward.” To which my friend replied, “There’s a lot of good lessons we can take from that.” So what are some lessons we can learn from that? There’s a lot of great lessons about progress. I want to focus this episode on what we can do in leadership to avoid being stuck in neutral. In leadership, we can’t be stuck in neutral. Instead, we need to be progressing to move forward! In this episode, I will share five ways we can move forward in our leadership. Create an agenda for your meetings and hold to it. The most ineffective meetings I have ever attended have been the ones where there was no agenda from the start. Everyone showed up to the meeting with different expectations which led to confusion, frustration, and ineffective meetings. The agenda may seem insignificant or be overlooked, but it is extremely important for the success of the meeting. The agenda acts as a roadmap for the meeting. It provides direction and helps people stay on track. The person in charge of taking meeting minutes. Hello, and welcome to the Leadership Done Right Podcast, Episode 62: 10 Questions to Determine if You’re a Know-It-All. Hi friends! I hope your summer is going well! It is crazy how fast this summer and year are going! Thinking about that reminds me how important it is to make the best of every moment! In this week’s episode, I am going to share 10 questions you can ask to determine if you are a know-it-all. Before we get to that, I want to share a story with you. Several years ago, I traveled with my family to visit friends of ours. We spent the weekend with them and had a lot of time to visit. At the time, I was in high school and loved to play and talk sports. So, needless to say, we talked a lot about high school and professional sports. We also talked about some of my other interests.